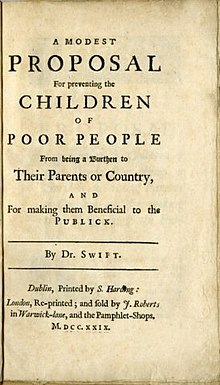 JONATHAN SWIFT, the great Irish satirist, wrote “A Modest Proposal” in 1729, in response to the British government and men of great wealth proposing and carrying out draconian solutions for the children of impoverished Irish. Since the Attorney General of the United States, Jeff Sessions, is now causing to be separated from their parents, and held in vast holding barns, thousand of minor children, he might as well acquaint himself with the full Swiftian solution. Carried out expeditiously, bundles of cash needed for a border wall could be made available, when the guards, gates and food services are no longer needed. It may be hard to believe that this is happening in the United States in 2018, that hundreds of children are being snatched from their parents, frequently under false pretenses, often screaming, and placed in vast warehouselike centers like the former Walmart in Brownsville, Tex., where nearly 1,500 boys now spend their days. The parents often don’t know where their children are, or when they will see them again. … The heartlessness of that is mind-boggling. It seems to elude the administration and its cheerleaders that this is not about crime or security, but about the most elemental human values; that ordering armed border guards to cruelly and needlessly rip children from mothers — in one case, while she was breast-feeding the child — goes against fundamental American values and undercuts its standing in the world. Call Congress. Find out who represents you in Washington, and let them know you want the practice of family separation to end. Ask them to support bills that will help reunited children already taken from their parents and also prohibit future removals. Those include the Senate’s HELP Separated Children Act and Keep Families Together Act. The American Civil Liberties Union offers a script for calling the Senate, though we suspect most callers will be able to find the right words themselves. … several nonprofits providing vital free legal aid that need financial support: The Texas Civil Rights Project; the Florence Project in Arizona; and Kids in Need of Defense and The Young Center, which work nationwide. Lawyers might also consider lending their expertise. The Catholic Charities of the Rio Grande Valley in Texas is helping families with supplies and humanitarian relief.